ENERSEA RESOURCES SDN. BHD., a Bumiputera-owned engineering company, commenced operations in 1996. To support its vision, the Company started its initial operations with the provision of technical manpower, of which the Company later had widened its scope of services into diversified areas of engineering, project management, procurement, fabrication, construction and hook-up commissioning of oil & gas, marine & infrastructure facilities, covering mainly Living Quarters & Helidecks; Fabrication, Construction & Industrial Services; Maintenance & Hook Up Commissioning; Engineering & Manpower Solutions; Engineered & Process Equipment; Marine Works & Services. Equipped with the globally-recognised Petronas license and registration, the Company has the credentials to provide comprehensive and integrated services to operators, consultants, fabricators and EPCIC contractors in various areas of project development of the oil & gas, marine and construction industries. The Company is also a registered Contractor with Pusat Khidmat Kontraktor (PKK) and Construction Industry Development Board (CIDB), thus providing us with the platform to undertake not only government and government-related agencies, but also private contracts. With its internal operations fully committed and based on ISO9001:2008 quality standards, the Company has now established itself as having industry-recognised best practice of internal quality standards with world-wide recognition and establishment, and also in compliance to the international quality in all of our past, present and future projects. In the OIL & GAS industry, ENERSEA has formed numerous strategic alliances with local fabricators for onshore & offshore fabrication works, oil & gas design consultants and EPCIC contractors for onshore & offshore EPCIC works, including offshore installation contractors (OIC) and offshore hook-up commissioning (HUC) contractors, in order to allow for flexibility in performing the various forms of oil & gas contracts, either offshore or onshore. In the MARINE industry, the Company has also formed strategic partnerships with various foreign marine vessel-owned companies for local and international tenders for the provision of marine vessels and services. Our partners, on its own merit, are one of the major players in marine industries for South-East Asia, thus allowing the Company to tap the market of becoming one of the marine suppliers for all type of oil & gas upstream activities, from maintenance and shutdown to installation and hook-up works in Malaysia and throughout the world. In the CONSTRUCTION industry, the Company has formed a strategic partnership with an Asia Pacific-based construction company, capable of undertaken any sort of infrastructure or building works without any limit for contract value. This has greatly enhanced the Company’s capability in construction and fabrication services, thus, enable us to participate in any local and international tenders, to the extent that all types of contracts, even turnkey or privatisation works are now with our reach. With these alliances, the Company has also increased our capability and expertise in the specialist areas of expertise and aims to command a sizeable market share in the areas of Living Quarters & Helidecks; Fabrication, Construction & Industrial Services; Maintenance & Hook Up Commissioning; Engineering & Manpower Solutions; Engineered & Process Equipment; Marine Works & Services. To become the leader in the our fields of service, namely Living Quarters & Helidecks; Fabrication, Construction & Industrial Services; Maintenance & Hook Up Commissioning; Engineering & Manpower Solutions; Engineered & Process Equipment; Marine Works & Services by harnessing the strengths of a high technology-based qualified engineering team to deliver competitive, value-added engineering products and services to meet and exceed the needs of the Oil & Gas, Marine and Construction industries in Malaysia and throughout the world. 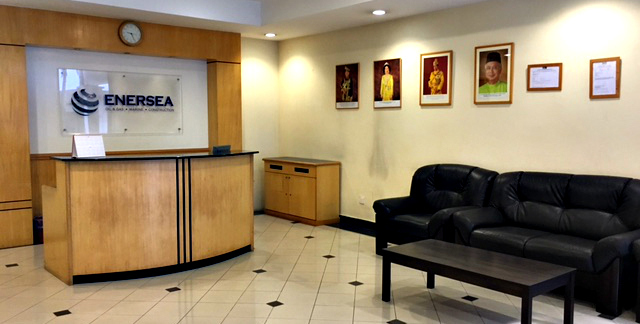 ENERSEA shall deliver the desired quality products and services to our clients by providing all the required and value-added resources in a safe, timely and professional manner. ENERSEA shall have mutually beneficial and strong strategic partnerships with our clients, partners, subcontractors and suppliers. ENERSEA shall focus our efforts on our core areas of expertise in line with our business interest by continuously innovating, enhancing and developing our professional standards to promote the state-of-the-art solutions to engineering problems. ENERSEA shall create value for its shareholders, business and social communities, with equal emphasis on promotion and care for public health, safety and environment as paramount consideration for work culture. It is the written policy of ENERSEA to provide its clients with the quality that exceeds the specifications set out by the client. In lieu of this, the Company has made a strong commitment in achieving a high level of quality for its products and services which shall, not only conform to contract and regulatory requirements and fit for its intended purpose, but also exceed the expectations of the client. To ensure that our clients shall be completely satisfied with the level of services we provide, the Company operates a fully documented Quality System in its daily operations, which was planned and developed with its management system throughout the organisation. The Company’s Quality Assurance programme follows the recommendation of and complies to the minimum requirements of ISO 9001:2008. Conformance to operational practices and to contractual and regulatory requirements is determined on the basis of objective evidence of compliance with system requirements. As such, the programme strictly ensures that all types of works are performed in a systematic manner, non-conformance is automatically identified with the necessary effective remedial measures taken to prevent recurrence, and performance is continually assessed with any improvements to be identified and implemented continuously. ENERSEA shall deliver our products and services to our valued customers with the highest professional standards with the agreed schedule with paramount consideration towards care for public health, safety and environment. ENERSEA, as a commitment to quality, is dedicated to continuous improvement throughout the organization, strives to analyse and remedy problems in service and product performance by monitoring key processes and making appropriate changes as and when necessary, and shall achieve the quality objectives by implementing a documented quality assurance programme that is consistent with the disciplines of ISO9001:2008. It is ENERSEA’s policy to conduct its business activities in a manner that accounts for the occupational health and safety of all persons while safeguarding the environment. The Company places great importance to the health and safety of its employees and environmental protection. No task or goal is so important that health, safety and environment (HSE) should be compromised. We are committed to maintain our HSE objectives and all levels of management are responsible to implement them conscientiously and effectively. Observe and comply fully with all legislative requirements. Provide a healthy and safe workplace for its employees, clients, contractors and the public. Prevent all occupational diseases and promote the health of its employees. Ensure safe working practices are adhered to. Ensure all sub-contractors and vendors comply with ERSB’s HSE standards. Encourage and promote improvement of HSE standards within the work site and the industry.